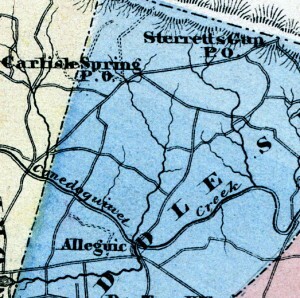 According to the Pennsylvania Historical & Museum Commission, the farthest northern point attained by an organized body of the Confederate Army was present day Pennsylvania Route 34, about 1 mile north of Carlisle Springs. The Pennsylvania Historical marker, erected in 1929, states that on the morning of June 28, 1863, an organized band of the Confederate Army of Robert E. Lee reached the farm of Joseph Miller near Sterrett’s Gap. There is no evidence as to whose command these Confederates belonged to as none of their records from the Gettysburg campaign indicate an exploration near Sterrett’s Gap. Check out ExplorePAhistory.com for more information and details on the historical marker. Another common conception of the farthest northern point or high-water mark of the Confederate Army was during day 3 of the Battle of Gettysburg. Union troops were positioned behind a small grove of trees within a confined area known as “The Angle” on July 3, 1863 during “Pickett’s Charge.” The first government historian of the Gettysburg battlefield, John B. Bachelder, conferred the title “High Water Mark of the Rebellion” to this small grove or “copse” of trees. Bachelder’s influence led to the creation of the “High Water Mark of the Rebellion Monument,” dedicated in 1892. For more information the National Parks Service website and the Historical Marker Database provides further details, maps and images. In the western theater, there are several locations that stake claim as the northern most point obtained by the Rebels. During the Battle of Salineville on June 26, 1863 near Salineville, Ohio, Confederate Major General John H. Morgan evaded Union capture before finally surrendering near West Point, Ohio. A marker commemorating Morgan’s surrender and the northern most engagement of the Confederate Army is located on present day Ohio Route 39 about 3.4 miles west of Salineville. In Davis County, Iowa, a plaque observing a Confederate raid on October 12, 1864 led by Lieutenant James “Bill” Jackson is located in Bloomfield, Iowa, slightly north of the Morgan marker in Ohio. Further north than all these locations is St. Albans, Vermont where on October 19, 1864, Confederate Lieutenant Bennett H. Young raided the small town from Canada located about 15 miles south of the border, robbing several banks with a small Rebel force. While there was never an engagement between Young’s forces and a Union force, the St. Albans Raid is considered the northern most point occupied by the Confederates.